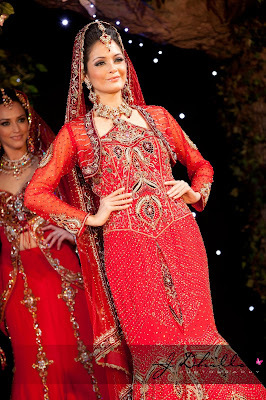 Indian-based Roshan's kicked off the 2011 Asiana Bridal Show in London with their collection of red asian bridal dresses. These definitely weren't your typical red bridal lehngas, and seeing them all in one go was a bit overwhelming! The menswear in the first two photos was by asianfashionblog favourite Ziggi Studio - look out for my full review of the Ziggi Studio collection coming soon. 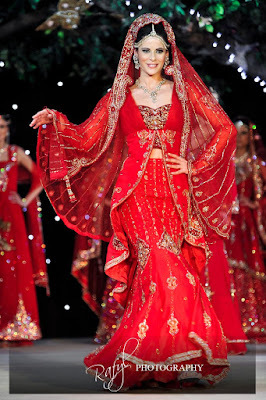 In the meantime, leave a comment and let me know your thoughts on these red hot bridals! 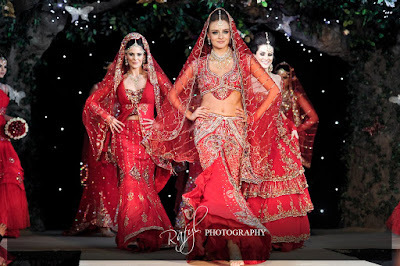 Don't think there is a single flattering cut amongst all of the red Roshan bridals. V disappointing ! Yep I agree, all the same shade of red as well there wasnt a lot of variation at all. I found the outfits quite fussy with too much going on, I dont think they would be very flattering on anyone other than model?! Do you know who did the female models hairstyles please?